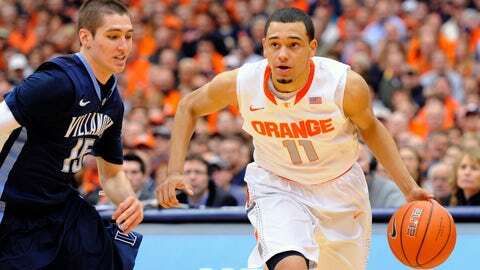 Freshman Tyler Ennis had 20 points and four rebounds in 37 minutes in the Orange's 78-62 win over then-No. 8 Villanova on Saturday. Trevor Cooney/Tyler Ennis, Syracuse: In a win over No. 8 — and previously unbeaten — Villanova, the two Syracuse guards were spectacular. Ennis, a freshman point guard, had 20 points in 37 minutes while Cooney added a game-high 21 (including 5-of-8 from three). Cooney also had three steals. C.J. Fair was the Preseason ACC Player of the Year, but these two are making it that opponents can’t just concentrate on stopping him. Cooney is deadly from the outside, while Ennis gets to the basket and controls the game at the point as well as anyone in the league. Jabari Parker, Duke: Ho, hum. Just another 20-point effort from Duke’s freshmen phenom, who had 23 points and eight rebounds in 27 minutes in the win over Eastern Michigan on Saturday. Next. Eric Atkins, Notre Dame: With Jerian Grant suspended for a year due to academics, someone is going to have to step up for the Irish. Atkins did just that in the overtime win over Canisius, scoring 30 points on 10-of-14 shooting (6-of-8 from three), adding seven assists and two steals. He did have seven turnovers, but he also played 45 minutes so we can let him slide on that one. It’ll be hard to ask him to duplicate that kind of effort night in and night out, but if he can, Notre Dame could still have the kind of season many thought it would have. Trae Golden, Georgia Tech: The Tennessee transfer guard hasn’t been very consistent this year, but he had 24 points in a win at Charlotte on Sunday on 7-of-13 shooting, including making the game-winning three-pointer with 3.6 seconds left. T.J. Warren, N.C. State: He continues to lead the league in scoring, and he had yet another great game in a narrow home loss to No. 25 Missouri on Saturday night with 24 points on 11-of-23 shooting, adding 13 rebounds, three assists, two steals and two blocks in 37 minutes. Only problem was he didn’t score the last 10 minutes of the game and didn’t take a shot for the final 5:50. Obviously, that’s something that needs to be rectified, but he can only carry the team so far. Honorable mentions: Dez Wells (Maryland) had 18 points and 10 rebounds in a win over Tulsa on Sunday. … His teammate, Seth Allen, made his debut this season, coming back from a broken foot, and had 15 points in 21 minutes. Maryland desperately needs their sophomore point guard to get well quickly. … Duke’s Andre Dawkins and Rasheed Sulaimon each had nice games against Eastern Michigan. Dawkins had 20 points in 26 minutes (6-of-10 from three), adding two steals and two blocks, while Sulaimon — who had been struggling — added 13 points, three assists and two steals in 22 minutes. … Garrick Sherman (Notre Dame) had 17 points and ten rebounds in an overtime win over Canisius on Sunday. … James Michael McAdoo (UNC) led the Tar Heels in scoring against Northern Kentucky with 14 points, adding six rebounds, one assist, one steal and a block in 26 minutes. … Justin Anderson (Virginia) had 14 points and eight rebounds in a win over Norfolk State. Trae Gordon scored 24 points, including the game-winning three-pointer with 3.6 seconds left as Georgia Tech beat Charlotte 58-55. Georgia Tech. The Yellow Jackets have been up and down all year, but they got a very nice win at a pretty good Charlotte team that knocked off Michigan earlier this season. It wasn’t a pretty game — the final was 58-55 — but considering Georgia Tech had yet to get a win that good this season, the Yellow Jackets will certainly take it. No. 2 Syracuse over No. 8 Villanova, 78-62. In a battle of unbeatens, Syracuse found itself down 25-7 at home early. But the Orange went on a 20-0 run to retake the lead, and while it was back and forth for most of the second half, Syracuse pulled away in the end. Villanova focused its defense on trying to stop C.J. Fair. That’s no longer a viable option with his teammates stepping up as much as they have early this year. As the non-conference winds down, Syracuse looks like clearly the best team in the league right now as it prepares to start its first season of ACC hoops. The Hokies weren’t going to be very good this year anyway, but after a season-opening loss to USC Upstate, they rebounded nicely and got some good wins over teams like West Virginia and then later Miami to open up their ACC slate. But you can’t lose at home to UNC Greensboro. It was just the Spartans’ second-ever win over an ACC opponent, and coupled with that loss to USC Upstate, the Hokies might have gotten their only ACC win of the season already. The senior is one of Virginia Tech’s best players, but it didn’t show against UNC Greensboro when he shot just 1-of-12 from the floor and turned it over three times, adding just two rebounds and two assists in his 37 minutes of action. Virginia Tech is not going to beat anyone when he plays like that. It’s just that simple. Again, a team effort here worth noting is Boston College against VCU. The Eagles were blown out and had just 10 assists to 23 turnovers against the famed VCU Havoc defense. And they shot just 38.6 percent. Individually, though, point guard Joe Rahon was 1-of-7 from the floor and had three points in 31 minutes, dishing out two assists but turning it over five times and committing two fouls. And two more experienced teammates — Lonnie Jackson and Patrick Heckmann, who have each seen plenty of playing time in their careers — continued two struggle, combining for no points in 34 minutes (17 each) on 0-of-5 shooting, adding three rebounds and two assists, but one foul and four turnovers. No wonder the Eagles are having problems winning games if their more experienced players can’t contribute. Honorable mentions: Josh Hairston (Duke) played 11 minutes, took no shots, got one rebound and committed two fouls and turned it over twice. 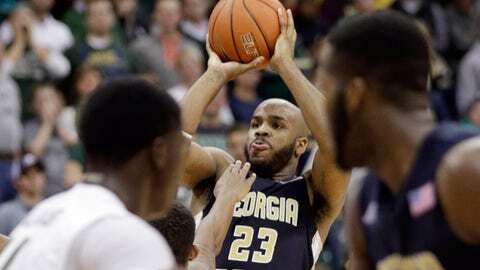 … Georgia Tech’s Kammeon Holsey missed his only two shots at Charlotte that he took in 17 minutes, adding four rebounds, three fouls and two turnovers. … Wake’s Devin Thomas had nine points in the loss to Xavier in 25 minutes, but was 5-of-10 from the foul line and 2-of-8 from the floor, adding four rebounds, one assist, four fouls and four turnovers in 17 minutes.